How to SUM a range but ignores SUM result in between?, i.e. 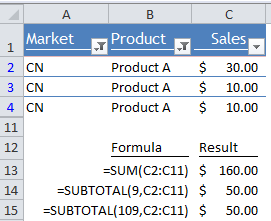 How to get a Grand Total with SubTotals in between? How to SUM but ignores hidden cells or filtered cells? A simple SUM for the whole range may double count as it includes all the subtotals in between. For the example above, using SUBTOTAL instead of SUM offers you a simple solution as SUBTOTAL is designed for ignoring SUBTOTAL in between. You may think of an even simpler way: =SUM(Range)/2 to tackle the double count issue. That could be true, just to make sure you won’t need to remove all subtotals one day in the future. Also what if you need to calculate the AVERAGE instead of SUM? Do you have a simple formula like =AVERAGE(Range)/2? I don’t think so. 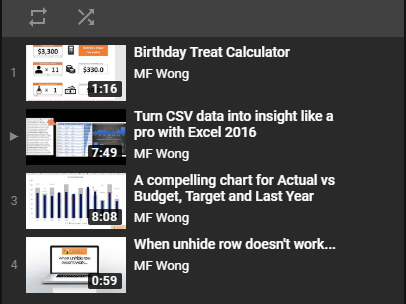 For me, I use functions 3 (COUNTA) and 9 (SUM) most often, 1 (AVERAGE) sometimes. When there is no hidden/filtered rows, they all give you the same result. Both SUM(Range) and SUBTOTAL(9,Range) give the original result; while SUBTOTAL(109,Range) gives you the summation of visible cells only. When AutoFilter is turned ON and applied, SUBTOTAL(9,Range) and SUBTOTAL(109,Range) basically behave in the same way: i.e. 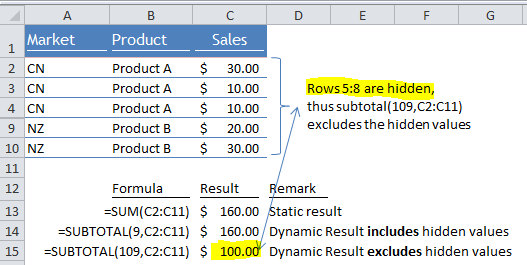 exclude hidden values. 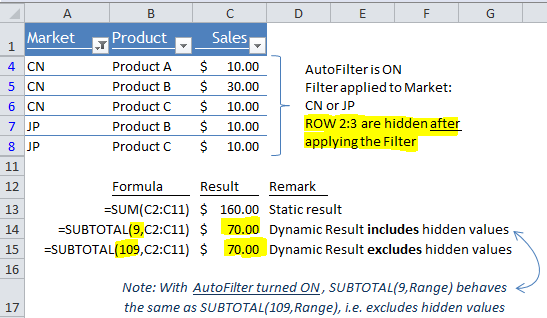 Before I know how to use Pivot Table and SUMIF(S), I used a combination of AutoFilter and SUBTOTAL to solve sum if questions. 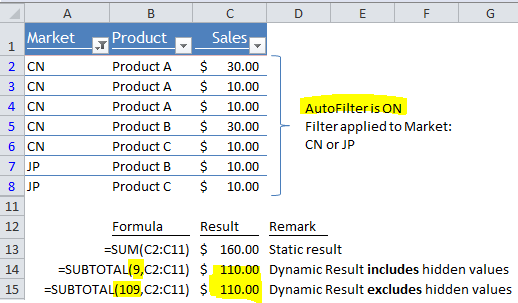 For example, if you want to find out the total sales of Product A to China (two criteria here; supposed to use SUMIFS), I simply use Subtotal(9,Range) and then applied filters accordingly. Not that efficient actually (when I look back). 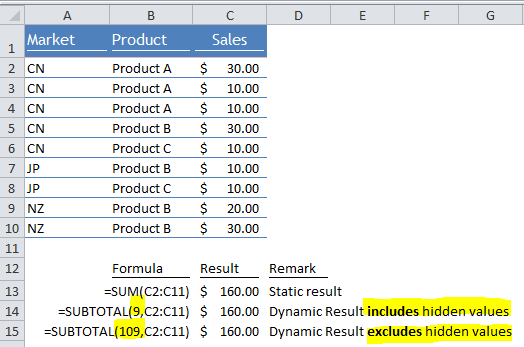 This entry was posted in Excel Tips, Formula and tagged SUBTOTAL, SUM. Bookmark the permalink. The clearest and simplest explanation I’ve been able to find about the subtotal function. Subtotal the Grand Total……who would have thought? Works like a charm! 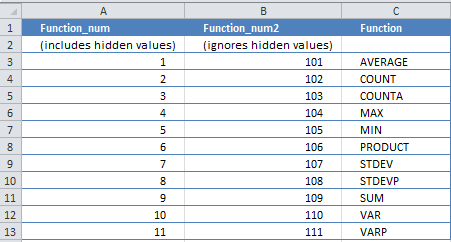 Have you though about following up this post with the aggregate function so that error values can be excluded like hidden rows etc. Thanks for your kind words. Glad that it helps you to understand the SUBTOTAL better. Good idea to have a post for AGGREGATE. 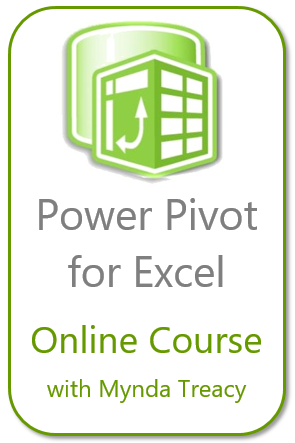 Actually it is the new function I love in Excel 2010. I will put it on my list of idea and will write a post of it in the future. Thanks for your feedback and glad that you like it. I plan to post on weekly basis (except if I am traveling). Pls come back and visit. Comments are always welcome.